Please select the size of the leather pants. 60 size is currently out of stock. Hurry, only 3 left in stock! Hurry, only 2 left in stock! Aron men’s light-brown leather shorts with belt. These fashionably bold traditional Bavarian shorts in light brown are made from 100% leather. 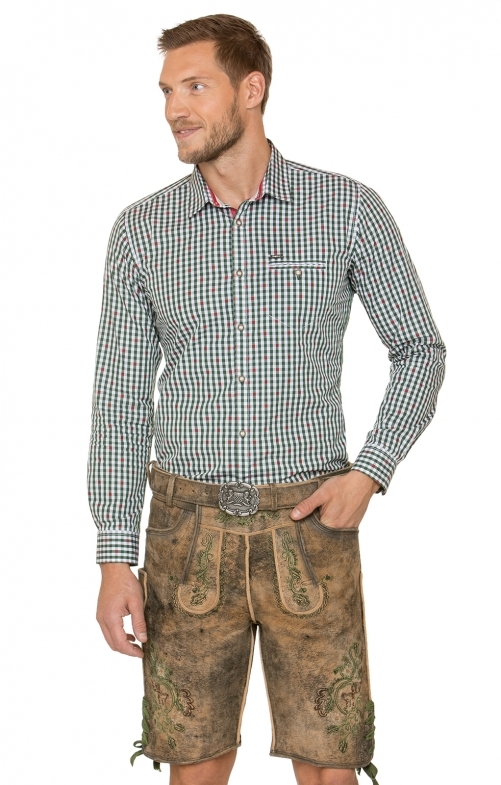 Men are sure to impress at Oktoberfest with these traditional yet bold authentic shorts with embroidery in dark green, which can be found on the button up bib and cuffs. The shorts come complete with a belt for a comfortably modern feel. immediately - order within the next x hour(s) x Min. for a Friday dispatch. Super verarbeitet und passt wie angegossen Preis Leistung ist super!!! Super, gutes Preis-Leistungsverhältnis. Bin sehr zufrieden. Danke.